The Power Supply 24VDC 15A provides efficient power at 24VDC, 15.0 Amp, 350 Watts. It is protected against over-current, over-voltage, and over-temperature. The output voltage can be adjusted between 21.6 and 28.8V using the adjustment screw. This power supply protects itself from over-current situations by momentarily cutting power to the output. If your application requires a power supply that will handle these over-current situations more gracefully, you should look at the PSU4017_Current Limiting Power Supply. This power supply requires you to supply your own power cable to provide power from the mains. You will need to cut and strip the end of the cable to connect it to the power supply. 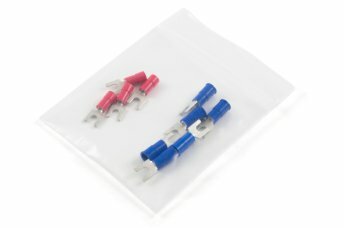 We recommend crimping the connectors included with this power supply to the end of the power cable for a better electrical connection to the terminals. *This is in low range. There is a dip switch on board that will set the supply into high range which changes the input range to 180-264VAC.